Most communicators begin their professional lives in tactical roles, writing articles and producing other content. At some point, however, some communicators want to elevate their roles and take on more consultative responsibility. 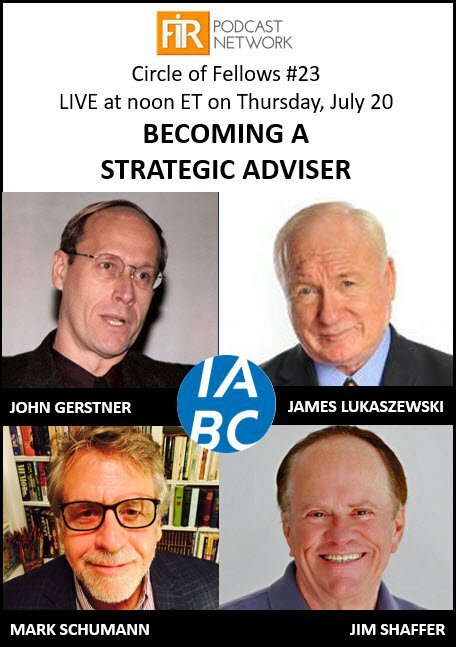 What does it mean to be a strategic communication adviser? What are the skills required and what are the goals of the role? Is it possible to adopt this role without understanding the broader work of a management consultant? Should communicators at that level even confine themselves by retaining the “communicator” label? These issues and others will be on the table during a live hour-long discussion with four IABC Fellows (the highest honor IABC confers upon members). Join us on Thursday, July 20 at noon EDT, and bring questions via Twitter using the hashtag #COF23. James Lukaszewski, America’s Crisis Guru ®, is a bestselling author, national speaker, and trusted strategic advisor to FPO and NPO business operators and leaders during crises, disasters, reputation attacks, contentiousness and when the boss’s future is at stake. Corporate Legal Times listed him as “one of 22 crisis counselors to have in your speed dial when all hell breaks loose.” For more than 30 years, he has confidentially guided hundreds of company leaders thru tough, touchy, sensitive situations. Lukaszewski’s strategies inspire constructive, ethical problem resolving management behavior. A powerful and inspirational speaker, he teaches executives and managers the lessons he has learned. A prolific author, he is quoted and interviewed often as one of the most recognizable leaders in his profession. Lukaszewski is on the web at www.e911.com. Thanks for this post-Holtz. I love the video.